Pfalz was the brainchild of Alfred Eversbusch, son of a foundry owner in Neustadt an der Weinstraße. It appears that he had built his own aircraft between 1912 and 1913, although the exact origin of the design is unclear. On June 3, 1913, the Pfalz company was registered, consisting of Alfred, his brother Ernst, and his brother-in-law Willy Sabersky-Müssigbrodt, as well as several investors: Richard and Eugen Kahn, and August Khan (unrelated). They initially proposed to build designs from Albatros, but their attempts at a deal amounted to nothing. Their next deal was with Gustav Otto Flugmaschinenwerke, building examples of his pusher-propeller biplane design. The original example was sent to Africa on a tour, and ended up being pressed into service as a scout. The company had always planned to set up shop at the new airfield in Speyer, but they initially had problems securing land for a factory. The Gustav designs were actually built in the Speyer Festival Hall, which was unused at the time. It was not until February 6, 1914, that the city agreed to sell Pfalz 7,000 m² to build their factory. Construction was completed in July, only one month before the start of World War I.
Adaptations of the D.III with the new Siemens-Halske Sh.III rotary resulted in the Pfalz D.VIII, which featured an incredible rate of climb (which it shared with the other Sh. III powered fighter, the Siemens-Schuckert D.IV). The Sh. III proved to be rather unreliable due to the ersatz engine oil available, and only a small number of D.VIIIs were built. These did see front-line use by Jasta 29 (Jasta Boelcke) at least, although it is unclear how many were built in total. The D.VIII was also adapted to triplane configuration as the Pfalz Dr.I for entry in the First Fighter Competition at Adlershof in January 1918. Like the D.VIII, it was powered by the Sh. III, and therefore completely outpowered its Oberursel UR.II powered contemporaries. Nevertheless, the Fokker Dr.I was the winner of the contest, which is not surprising considering that it was the only aircraft entered that was designed from the outset as a triplane, as opposed to being a quickly-adapted biplane. About a dozen Dr. Is were built and used operationally for some time. 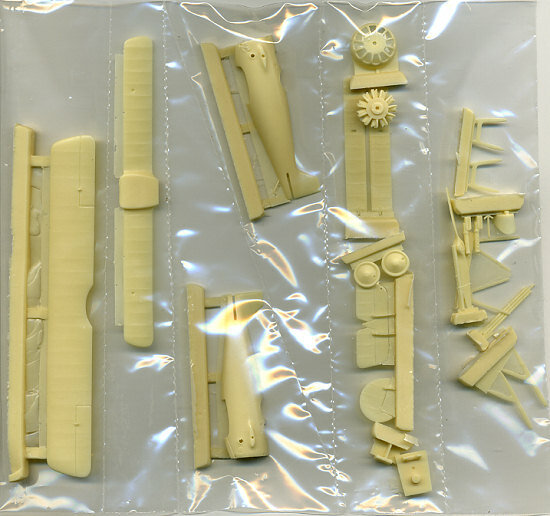 Packaged in the now-familiar compartmentalized bag, to keep the big pieces from making dust of the smaller ones, the molding on this kit is superb. I only found five pinholes; two on the leading edge of each full wing and one on the forward part of the horizontal stab. Fixing those will be very simple. The struts are quite scale and though they appear flimsy, care should be taken when removing them, once the model is rigged, it will be quite sturdy. As you'd expect on a WWI aircraft, the interior is quite basic with floor, seat and stick. The rudder pedals are molded in. The instrument panel is on the back of the twin gun mount. A superbly molded rotary engine is included along with Pfalz's most distinct cowling. To get the engine/prop to spin, the modeler will need to find a shaft. Using brass t ubing would seem to be the best way to do this. There are additional info diagrams to be sure we get everything in the right place. In addition to a great painting and markings guide (two planes, any color you want as long as it is silver), there is a fine five view to provide rigging information. My kit included a set of plans as well, though I'm not sure if that will be in the marketed version. The decal sheet is very well printed and will be quite thin so one needs to take care when applying them. 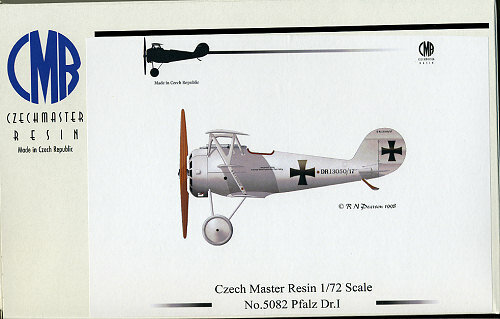 Czech Master Resin is probably the best resin kit maker in the Czech Republic and providing quality kits of interesting aircraft is one reason why they are so popular. This looks like another winner, especially as it is such an interesting and unusual aircraft. It is a kit you can get with confidence that you are getting a quality product.